A group of kindergarteners had their hearts broken yesterday when they showed up for a White House tour and were told they couldn't come in because staff had to prepare for the President's visit with the Pittsburgh Steelers. Also, because the tears of the innocent give Barack Obama sustenance. About 150 five-year olds from Virginia had scheduled the tour months ago and they had all worked many long hours sewing wallets to earn the $20 needed for a seat on the chartered bus. They even managed to pass the security screening for visitors, although I'm sure at least a few of them were criminals. Yet, when the bus got stuck in traffic and arrived at 1600 Pennsylvania Ave. just 10 minutes late, the President himself ordered that they be thrown off the premises, then he went and had brandy and cigars with a bunch of football players. Then he kicked a puppy just to hear it whimper. Paty Stine said the White House staff should have made an exception. She feels the kindergarteners were snubbed for the Steelers. "Here we have President Obama and his administration saying here we are for the common, middle class people, and here he is not letting 150 5- and 6-year-olds into the White House because he's throwing a lunch for a bunch of grown millionaires," Stine said. According to the White House, the group was actually an hour late and they held the gates open 15 minutes later than they said they would and the group still didn't make it in time. Whatever. 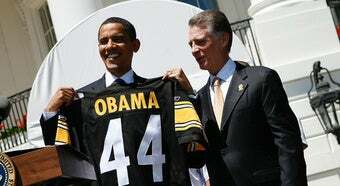 It's clear that Barack Obama loves Troy Polamalu more than he loves your kid. Now they know how Cardinal fans feel.